New Panathers signing Michael Palm-Toft. Photo: Ian Charles. 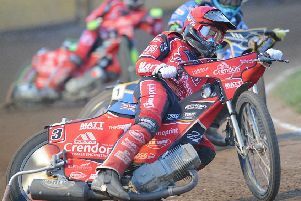 Peterborough Panthers chiefs have turned to Denmark to fill their injury void. The city club have tonight (March 20) snapped up Michael Palm-Toft for a minimum of 28 days while Adam Roynon is sidelined with broken and cracked ribs and a bruised lung sustained in the opening race of the new campaign last weekend. The 24 year-old Dane’s capture was completed in time for him to make his Panthers debut when they host Somerset Rebels in a Premier League Cup clash at the East of England Showground on Sunday (March 22, 1pm start). Palm-Toft arrives on an average of 4.92 which is less than the figure he achieved when riding in the Elite League throughout last season with Belle Vue. Club boss Ged Rathbone said: “We were able to thrash out a deal with Michael in a matter of minutes. “He needed next-to-no persuasion to come over and help us out for the next few weeks while Adam is recovering from his injuries. “We are confident he can impress and I’m sure it is a signing that will go down well with the supporters. Palm-Toft is an asset of fellow Premier League side Scunthorpe and raced for them between 2011 and 2013. He has also had a brief spell at Plymouth in the second tier of the sport. Palm-Toft appears to have had a change of heart about racing in the UK in 2015. He signed for another Premier League club, Workington, during the winter but then pulled out of their line-up due to a lack of sponsorship.